Hi there, my name is Jenny and I'm missing my little bird. 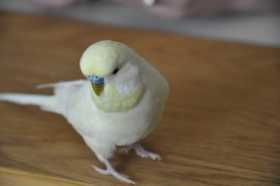 His name is Voxel and he's an English Budgie/Parakeet. VOXEL WAS LOST IN THE DURHAM CHAPEL HILL NC AREA 6205 FARRINGTON ROAD on SUNDAY the 24th. He could have flown far so I am looking at a wide area. He also could have been picked up by someone and brought to a shelter, rescue, vet, etc. He's about 7 inches in length, blue nose, and is a cream/white colour with yellow patches on his face. Very friendly!